Flowers and chocolate are a perfect combination, right? So how much better would it be if those flowers were made of chocolate? 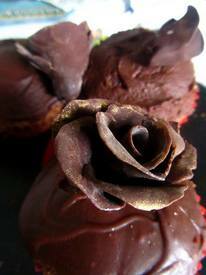 Chocolate roses are also a great way to add some sophisticated flair to cakes and cupcakes. They are made using modelling chocolate, a simple combination of chocolate and glucose which creates a flexible, moldable material. Ideal for roses and other simple flowers, it can also be cut or shaped into other decorations to liven up your baking.